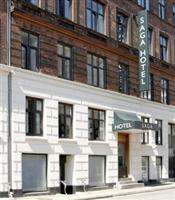 The Saga hotel is a charming family-run property located in the heart of Copenhagen, in the trendy and cosy quarter of Vesterbro, right next to the Central Station and the beautiful Tivoli gardens. This popular Copenhagen hotel is housed in a late 19th-century apartment building and offers comfortable accommodation at very reasonable rates. The property also lies within close proximity of the city's famous pedestrian street, Strøget. The surrounding area hosts a great variety of fine shopping and dining opportunities, from Japanese sushi bars, Thai & French cuisine and Danish steaks to vintage clothes shops and cool designer stores. The reception is open 24 hours and whether you need to find a restaurant, cafe, shop, sight, museum, concert or nightclub, the hotel's friendly staff will do their best to help you find the place to go.